Millennials are expected to make up a third of the global workforce by 2020, and as a result, businesses are scrambling to adapt their corporate culture and management style to accommodate the needs of the generation aged 18 to 35. The World Economic Forum’s annual Global Shapers Community surveyed more than 26,000 millennials around the world to gauge their views on topics ranging from the global economy to technology and innovation, and business and jobs. For employers, knowing what millennials want – and expect – from them is critical. 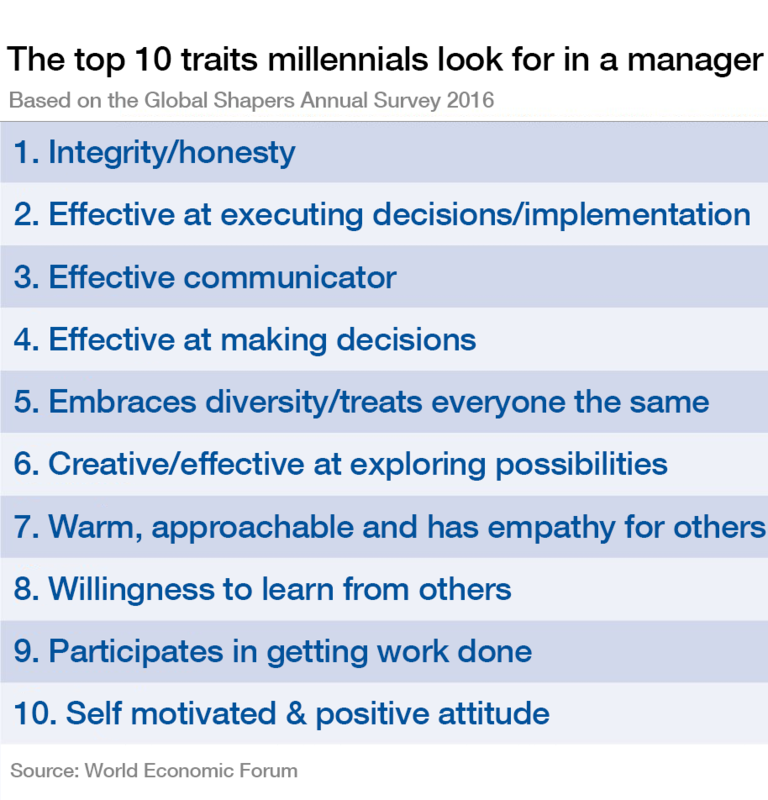 To find out more, the Global Shapers survey quizzed young people on the characteristics they look for in a manager. The top trait? More than one third of respondents said they valued integrity and honesty most in a manager. The next most important characteristic was being able to implement decisions effectively, followed closely by being a good communicator. After that, at number four, was being an effective decision-maker. Just over a quarter said that embracing diversity and "treating everybody the same" was important. The Global Shapers Annual Survey is one of the most geographically diverse surveys of millennials. Respondents are located in over 170 countries and territories, and are aged between 18 and 35 years of age (inclusive), 45% are male, 55% female. One third were aged between 22 and 26. The respondents include both members of the Global Shapers Community and young people who are not members of the Community. The Global Shapers Community is a network of over 450 city-based hubs of young, civically engaged leaders aged between 20 and 30. Purpose or profit: which would give you more job satisfaction?